Before getting into more details about the early Arctic warming research today, it might be reasonable to start with some general remarks. The first to mention is the fact that little analytic material seems to be available about the question when and where the Arctic warming commenced. The most usual dating is: a warming from 1920 to 1940. Only in one of the investigated papers it is merely noted: “ The period from 1918 to 1922 displays exceptionally rapid winter warming” (below:Polyakov). Another very surprising weakness is that by far most investigation relies on long-term statistics, in most cases by 10-years intervals, or even longer. Little attention has been given to short periods, for example on an annual basis, or a distinction been made between seasonal temperature series. All relevant data series show not only a very substantial difference in temperature deviations from long-term means over very few years in the late 1910s, or even from one year to the next year, but also by an abrupt deviation of temperatures between winter- and summertime. It is difficult to understand why these important aspects are widely ignored and did not received thorough attention, as only winter temperatures increased dramatically, while the summer temperatures changed modestly only. The paramount point is that the big warming in winter of 1918/19 was very sudden, very pointed, and a sustained event, which lasted for two decades. But this and other aspects will be discussed later, after having presented the current scientific conclusions. The following overview will present the main conclusion of some very recent investigations concerning the Arctic warming. More details about some papers are summarized in a linked Attachment. Although the authors note that the period between 1918 and 1922 displays exceptionally rapid winter warming, not only in the circum-Arctic region, northward of 62ºN, but also in the 55º– 85ºN zonal band, they undertake no efforts to elaborate this significant aspect in detail. Not too surprisingly they have little to offer in their conclusion, which says that: “The complicated nature of Arctic temperature and pressure variations determines the difficulty of understanding the causes of the variability, and of evaluating the anthropogenic warming effect”. The paper is of little help to understand what happened in the Arctic in the late 1910s. “Natural variability” explains nothing, and any “enhanced wind” must also have a cause, as already Brooks questioned similar claims already in 1939. According to the authors the early twentieth-century warming was largely confined to north of 60N, and that the 1920–39 warming phenomena was more pronounced during winter for the high Arctic. Non of the two interesting starting points is elaborated any further, but they nevertheless come up with the conclusion that the Arctic warming in the 1920s/1930s are due to natural fluctuations internal to the climate system. Although the title “Arctic change: multiple observations and recent understanding” sounds promising, the paper provides hardly any clue on the early Arctic warming event. 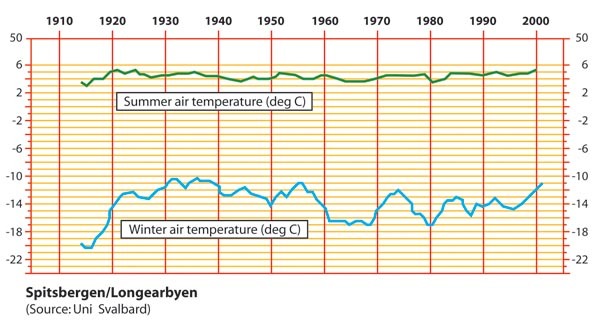 According his research seasonally and regionally averaged temperature anomalies of about 0,8 ºC for the 1930s and 1940s approached the magnitude in the 1990s. With reference to an earlier paper he concludes that the causes of the earlier warming shows large region-to-region, month-to-month, and year-to-year variability, which suggests that these composite temperature anomalies are due primarily to natural variability in weather systems. These few excerpts taken from some most resent works show quite clearly where science stands when it comes to analyse and explain the warming in the arctic over the last 100 years. From our viewpoint all reference papers demonstrate a too superficial elaboration of available data records, and their inability to recognise that the sea could only have caused the extraordinary temperature increase during the winter seasons. 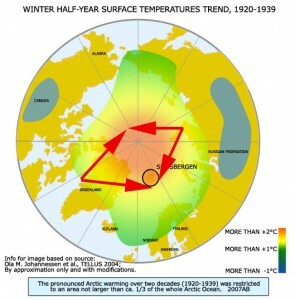 The missing of the principle point is, for example illustrated by the notion that the “temperature increase in the Arctic was caused by enhanced, wind-driven oceanic inflow into the Barents Sea”. Even wind does not appear from ‘nowhere’, but is generated by something. The warmer the ocean surface, the more vapour in the air. The bigger the contrast between low pressure (depression) and high pressure, the more wind in the air. The role of the oceans is what matters most. An analysis of the observation records shows that the global surface air temperature (SAT) has increased with 0.6 ° C since 1861, with a slightly higher rate of warming in the twentieth century (Jones et al. 1999). P. 2067. Using 400 yr of proxy data, Overpeck et al. (1997) suggested that, before 1920, volcanic aerosol loading and solar radiation were major contributors to Arctic SAT change. P.2067. In analyzing hemispheric and global temperatures, Jones et al. 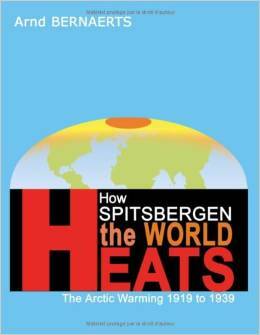 (1999) documented two distinct warming periods: from 1920 to 1945, and from 1975 until now. P.2070. The higher temperatures in the Arctic, during the 1930s–40s and the recent decades, and the lower temperatures, during the 1960s–70s and prior to the 1920s may be associated, at least partly, with the positive and negative phases of the LFO (low-frequency oscillation). P.2071. The seasonal differences in the alternate warming periods (1920s–30s and from the 1980s to the present) and cooling period (1940s–50s) are striking. For example, the warming during the 1920s–30s was very fast in spring, autumn and winter, but much weaker and slower in the summer. The period between 1918 and 1922 displays exceptionally rapid winter warming, not only in the circum-Arctic region, northward of 62ºN, but also in the 55º– 85ºN zonal band (Serreze et al. 2000, their Fig. 3). 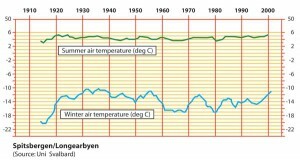 The rapid autumnal temperature rise, in the 1930s, was a local phenomenon that was observed only in Scandinavia and in the western part of maritime Russia. P.2072. This variability appears to originate in the North Atlantic and is likely induced by slow changes in oceanic thermohaline circulation [Delworth and Mann, 2000]. P.2075/6. However, SAT records demonstrate multi-decadal variability, which is stronger in the polar region than at lower latitudes. This may suggest that the origin of this variability may lie in the complex interactions between the Arctic and North Atlantic. P.2076. The huge warming of the Arctic, which started in the early 1920s and lasted for almost two decades, is one of the most spectacular climate events of the 20th century. During the peak period of 1930-1940, the annually averaged temperature anomaly from the area 60°N-90°N amounted to around 1.7°C. Whether this event is an example of an internal climate mode or of an externally induced phenomenon (by enhanced solar effects) is presently under debate. Here we suggest that natural variability is the most likely cause, reduced sea ice-cover being crucial for the warming. Analysing similar climate anomalies as occurred in the early 20th century, it was discovered that the simulated temperature increase in the Arctic was caused by enhanced, wind-driven oceanic inflow into the Barents Sea with an associated sea-ice retreat. The magnitude of the inflow is connected to the strength of westerlies into the Barents Sea. It is interesting to note that the increasing high latitude at which westerly usually flow wasn’t related, this time, to the North Atlantic Oscillation, which was simultaneously weakening. The Arctic warming from 1920-1940 is one of the most puzzling climatic anomalies of the 20th century. During a period of almost fifteen years, the Arctic warmed up with 1.7 °C and remained so for more than a decade. A gradual cooling took place in the late 1940s, bringing the temperature back to much lower values, although not as cold as before the warming period. Here, we have shown that this warming was associated and presumably initiated by a major increase in the westerly and south-westerly wind, north of Norway, this leading to an enhanced atmospheric and ocean heat transport from the warm North Atlantic Current, through the passage between northern Norway and Spitsbergen, into the Barents Sea. Contrarily to other studies (Stott et al., 2000), we suggest that the warm Arctic event just happened by chance, through an aggregation of several consecutive winters with pronounced, high latitude westerly in the Atlantic sector. High-latitude warm events are possible, as demonstrated by Delworth and Knutsson, (2000) and Johannessen et al., (2003) and they are generated in the course of a long integration with a coupled model. What consequences may have the findings of this study for the possible evolution of the Arctic climate? Notwithstanding an expected overall climate warming, it is suggested that the Arctic climate would be exposed to considerable internal variations during several years, initiated by stochastic variations of the high latitude atmospheric circulation and subsequently enhanced and maintained by sea ice feedback. Ola M. Johannessen, et al. SAT (surface air temperature) observations and model simulations indicate that the nature of the arctic warming in the last two decades is distinct from the early twentieth-century warm period. It is strongly suggested that the earlier warming was natural internal climate-system variability, whereas the recent SAT changes are a response to anthropogenic forcing. P.328, Abstract. Two characteristic warming events stand out, the first from the mid 1920s to about 1940 and the second starting in 1980 and still ongoing. Here, we show that the early twentieth-century warming was largely confined to north of 60N, whereas the latter warming encompasses the whole Earth (Jones et al., 1999) but is none the less significantly enhanced in the Arctic (Fig. 1a). P.329. Both the 1920–39 and 1980–99 warming phenomena are more pronounced during winter for the high Arctic. P.329. The anthropogenic forcing in the 1920s–1930s was by far too weak to generate the observed warming – the change. The GHG (green-house-gas) forcing in the early decades of the twentieth century was only 20% of the present (Roeckner et al., 1999). P.330. First, we theorize that the Arctic warming in the 1920s/1930s and the subsequent cooling until about 1970 are due to natural fluctuations internal to the climate system. Conclusion; P.337. Igor V. Polyakov, Roman V. Bekryaev, Genrikh V. Alekseev, Uma Bhatt, Roger L. Colony , Mark A. Johnson, Alexander P. Makshtas, and David Walsh; Variability and trends of air temperature and pressure in the maritime Arctic, 1875 – 2000; 2003; Journal of Climate, Vol. 16, p. 2067-2077, 2003. Extract via: Website of the Int. Arctic Research Centre, IARC), Alaska; or: http://www.frontier.iarc.uaf.edu/%7Eigor/index.php . I. V. Polyakov, G. V. Alekseev, L. A. Timokhov, U. S. Bhatt, R. L. Colony, H. L. Simmons, D. Walsh, J. E. Walsh, V. F. Zakharov, 2004, Variability of the intermediate Atlantic Water of the Arctic Ocean over the last 100 years, Journal of Climate, Vol.17, p. 4485-4495. Brooks, C.E.P. ; 1938, “The Warming Arctic”, The Meteorological Magazine, p.29-32. With reference to an explanation by R. Scherhag, 1937 that the rise of temperature derives from an increase in the strength of the atmospheric circulation, Brooks notes that this “only pushes the problem one stage further back, for we should still have to account for the change of circulation”. (2004), p. 328 –341, Corr. 559-560. James E. Overland; 2006, “Arctic change: multiple observations and recent understanding”, Weather, Vol. 61, p. 78-83. James E. Overland, Michael C. Spillane, Donald B. Percival, Harold O. Mofjeld; 2004, “Seasonal and Regional Variation of Pan-Arctic Surface Air Temperature Over the Instrumental Record”, Journal of Climate, Vol.17, pp.274-288. Lennart Bengtsson, et.al., op.cit (Part A, I); See also: K.F. Drinkwater, 2006, “The regime shift of the 1920s and 1930s in the North Atlantic”, in: Progress in Oceanography, p.135.